The history of video games where animals play in traffic is a very staggered one. Frogger hit the scene in 1981, then nary a croak was heard from any other property until 2014's Crossy Road gained mobile popularity. Dangerous Road on the 3DS eShop borrows a lot from its Crossy counterpart, but is unlikely to leave its splat on history. Dangerous Road contains two ways to hit the road: Goal Run and Survival Run. In Goal Run, players must navigate stages to find 3-5 checkpoint flags before reaching a finish flag. A compass points to the nearest flag and players are free to backtrack and navigate however they please without penalty. There is a time limit, however - as ample as it may be - and hitting any vehicle, train, or river will instantly kill your critter and force a restart of the stage. Although they are indeed called checkpoints, there is no starting over from any flags you may have reached. 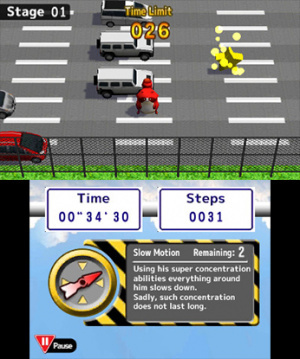 The second mode, Survival Run, places your animal on busy boards of highways and tracks and demands 60 seconds without a collision. A "Rush Hour" 30 seconds in will increase the rate of traffic and overall danger. There are a few advantages players have against the oppression of human transportation. Picking up a star will create a 5-second bubble of truck-slaying invincibility; these are placed in the same spots every time in Goal Run and will pop up intermittently in Survival Run. Players can also choose from four different animals, each with a different special ability. 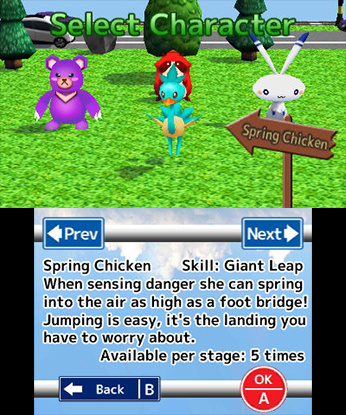 Pascal the raccoon can slow down time, Rabby the rabbit can hop on water, and Spring Chicken can leap temporarily into the air - each of these powers can only be activated a certain number of times each stage. 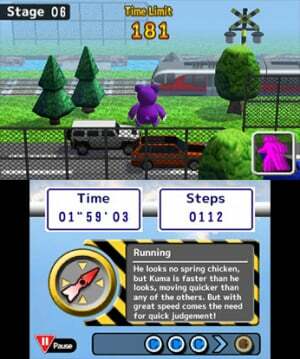 The fourth animal, Kumagoro the bear, is permanently faster than the rest. Perhaps he got into some bearformance enhancing drugs. One would feel excitement to be at the top of the list of a game about dodging traffic, but Dangerous Road struggles to deliver. The open nature of Goal Run tends to take the pressure off of most situations. Many stages feel more like simple mazes than twitch experiences. When you see a path of peril to cross, many times a star or bridge isn't far away to turn it into a cakewalk. When trouble does arise, it tends to becomes more frustrating than exhilarating. Movement requires hitting a button on a directional pad once per hop; there is no holding down. So when a situation arises that demands fast movement, it sometimes feels as if there is a slight delay in movement that can make a world of difference when a car is bearing down. Worse off, tense moments can lead to a hammering of the directional button, making the animal move one or two spaces farther than intended when one lets up; eepeating levels due to snags like this are a letdown. Survival Mode is a bit more exciting, but there just isn't much to strive for. There's staggeringly little in the way of new elements as stages progress, and there are no new characters or bonuses to work toward, either. There are the 30 stages of Goal Run and 20 stages of Survival Run, and that's pretty much it. You can attempt to beat your records in time and steps taken, but there isn't a leaderboard to provide any incentive. 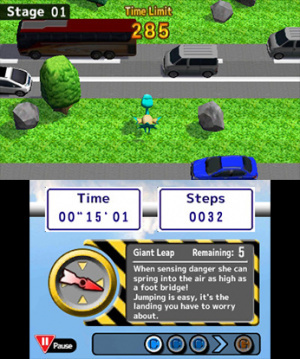 The presentation of Dangerous Road is low-key, with simple character models and a couple of songs. The title track sounds a lot like Planet Wisp in Sonic Colours, which is a nice surprise. The overall look isn't unpleasant, but it doesn't stand out. Dangerous Road might scratch that crossing itch on the 3DS for fanatics of this style of game, but not in a way that feels broadly compelling. A desire for tighter responsiveness aside, it functions reasonably well. Still, with repetitive gameplay, frustratingly unintended deaths, and little sense of skill or accomplishment, some chickens will want to stay on their side of the Interstate. Two failed car games in a row! I hope Nintendo starts implementing stricter quality control on the Switch eShop. The PSN marketplace doesn't really seem to have this problem. And Xbox Live... well, Xbox Live makes it as hard as possible to find indie games. All 5 of them that are on the platform. @A01 PS4 does have a lot of shovelware games also. like Goat Simulator, I am bread, Super Dungeon Bros and etc. Does it have Meme Run and RCMADIAX's games though? At least there is still the superb "Brick Racer" for the "New 3DS". Still waiting for PONG and a calculator app with more colors. Animals playing in traffic was also the theme of Activision's Freeway on the Atari 2600. Wherever did that terribly photoshop'd pic come from? @6ch6ris6 Okay so... 2 games that take place in a city and involves cars! How about that? Damn, I clicked because I thought this might be that rare thing - a driving game on a Nintendo console! But no, it's some frogger clone. Great. This isn't such a bad game. It could be so much worse, like a game from RCLAZYASS or any other asset flippers attempts at "video games."